I will hold my hand up, and so should quite a few others, for perhaps underestimating Brazil's ability to hold what turned out to be an overwhelmingly successful World Cup. All of those delayed, costly and accident-prone stadiums came good in the end - at least in terms of crowd control, ticketing and the overall match experience. Remember - so far behind schedule were some venues, like the Corinthians Stadium in Sao Paulo, that no full-scale test event had taken place there before the World Cup kicked off on 12 June. While the main entry airport for football fans to Brazil, Rio's Galeao, is still a shabby embarrassment of a transport hub, most other regional airports coped well with the vast numbers of flights and fans that came and went. And then there were the much-anticipated protests. Apart from the nasty, violent scenes in Sao Paulo on opening day, it was clear that the vast majority of Brazilians did not support the notion of anti-government and anti-World Cup protests disrupting the tournament itself. The Brazilian government had made it abundantly clear that protesters would, in no circumstances, be allowed anywhere near the wide exclusion zones they had put up around the stadiums. The overwhelming force used to quash that peaceful protest on the opening day was a clear sign that no quarter would be given. Stun grenades, rubber bullets and batons were all used liberally by riot police against demonstrators who staged nothing more threatening than a sit-in protest some 12km (seven miles) from the Sao Paulo stadium. The violence used by the police was arbitrary and excessive. I was there and I saw it - but it worked. It worked in the sense that until the day of the final in the Maracana there was no other serious attempt to disrupt the Cup by means of civil protest. When it did become an issue again, the forces of law and order were similarly determined Fifa's big party was not going to be ruined. In an almost unprecedented move, tens of people were "pre-arrested" - detained on suspicion of planning civil disorder. And, again, those that did take to the streets of Rio to protest in the hours before the Germany v Argentina final were given short shrift. The protestors were "kettled", unable to move or march. Those who did try to break though were severely beaten, little attempt made by police to differentiate between journalists and demonstrators. But again it has to be emphasised that civil disorder was minimal and was much, much less of an issue than many correspondents and pundits had predicted. It is somewhat ironic that the most violent scenes during the Cup came not in Brazil but in the Argentine capital when several gangs or "barras bravas" fought running battles with police in Buenos Aires after their side was beaten in the final by Germany. Some had predicted, or feared, that an early exit from the tournament for Brazil would precipitate civil disturbances and a sudden lack of interest in the tournament. Brazil, by hook or by crook, managed to stay in the competition until the semi-final stage with what was a lacklustre and unimaginative team - especially after the loss of star player Neymar through injury. But when defeat came, in the shape of a 7 -1 mauling by Germany, this football-proud nation was so shocked, so embarrassed that they could barely muster the energy to protest. Brazil were humiliated in that semi-final and also by Holland in the (meaningless) third place play-off and for days the nation has scratched its collective head, searched deep into its soul and written volumes of analysis. But nothing can take away from the fact this was, from a footballing perspective, a wonderful World Cup. But who was it a World Cup for? TV audiences around the world can have nothing to complain about. The sport was outstanding, the technical quality of the coverage provided images that made you feel as if you were on top of the action, with a pitch-side seat at the stadium. As I travelled throughout Brazil, from Sao Paulo to Manaus to Salvador and Belo Horizonte it gradually dawned on me that football, or at the very least the World Cup, has become a middle-class sport. That has long been the reality of the sport in Europe where multi-million-pound player salaries and clubs listed on the stock exchange mean football at the highest level is increasingly detached from the man or woman on the street. There were no prawn sandwiches for sale in the Fifa-licensed bars at the stadiums in Brazil, but the mood was very similar to the appreciative, well-behaved football ground of the English Premiership - which is not necessarily a bad thing. 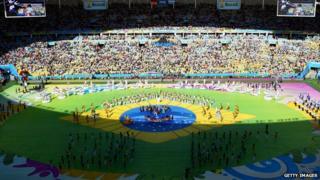 What is bad is that only a small cross-section of Brazilian society actually got to see the games. Salvador, for example, is an overwhelmingly black city, populated by the descendants of slaves from West Africa. The football fans of that delightful city love their sport as much as those in Rio and Sao Paulo but the vast majority of fans at the games were white and affluent. In Belo Horizonte, at the scene of Brazil's capitulation to Germany in that unforgettable semi final, much of the post-match media focus was on the tearful Brazilians in the crowd, young and old - cruelly picked out by television cameras - having to suffer the ignominy and humiliation of defeat. But in many ways those inside the stadium were the lucky ones. At least they got to take in the atmosphere, see a game first hand and experience the raw emotion of a World Cup. As one community football coach in a run-down part of Belo Horizonte told me: "For my boys the World Cup may as well have been in South Africa or Germany". He continued, as two boys in Brazilian replica shirts kicked and dived in the dust: "The tournament hasn't touched their lives at all - sure they've watched it all on TV, but that's it". Fifa's officials are flying back to Switzerland, delighted in having presided over what can arguably be called the "best World Cup ever". But the legacy to Brazil is still questionable. Several stadiums will struggle to survive financially now the tournament is over, the club game in Brazil is underfunded and most of the best players are based overseas. It is a brutal fact that Brazil has not produced a truly fantastic team for many years. But Brazil pulled it off. It may have been all last-minute but a largely successful World Cup will give the country huge impetus and confidence ahead of the Rio Olympics in two years' time. It will also silence those critics, like this writer, who are wondering already what is going to go wrong between now and 2016. World Cup defeat an opportunity for Brazil? World Cup 2014: The real cost of losing?